This meal was sparked off by the Kale in my vegbag this week, which I cooked as per the great recipe which I’ve blogged about before (see below) – Kale stir fried with seaweed, ginger and sesame seeds. The rest of the dinner was straight out of this fabulous vegetarian Japanese cookbook by Patricia Richfield which I found in my library (a copy of which I eventually came to own via Amazon – Used). 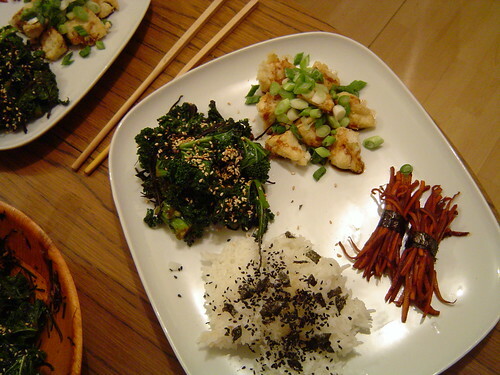 The dishes from that recipe book are: deep fried tofu with mustard soy sauce; carrot stick bundles tied with seaweed; plain japanese rice (Gohan) served with furiake, a rice garnish made of partly crushed black sesame seeds, ajituke nori seaweed and sea salt. can we do bodybuilding exercises at the age of 48 as i do visit the gym from the age of 20 but only seasonal .